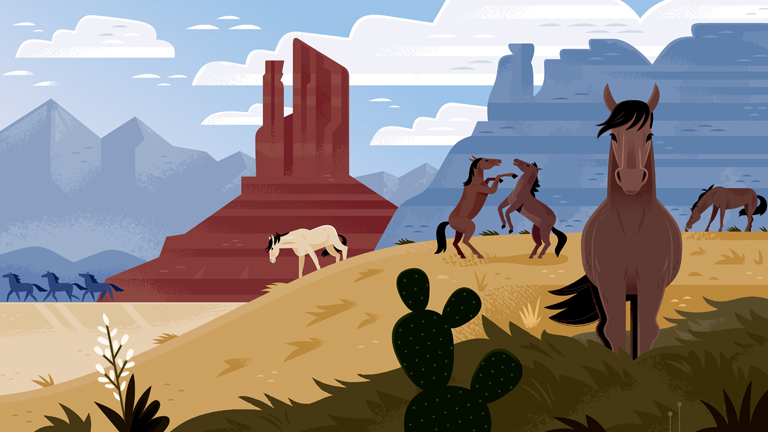 Wild Horse Country: The History, Myth, and Future of the Mustang, the second book by Dave Philipps ’00, is the work of a consummate reporter of high journalistic principles. Holding a master’s degree in journalism from Columbia, he is a national correspondent for the New York Times and the winner of a Pulitzer Prize for National Reporting in 2014. For this book, he embedded himself in desolate Western lands few humans want to inhabit where mustangs eke out survival. He researched in libraries with faded newspaper clippings and with scholars. He interviewed people who have made wild horses their cause: ranchers, slaughter buyers, and employees of the Bureau of Land Management (BLM). Philipps’s dedication of his book, “For Whitman and Frost, who were born wild and free . . .,” spells out the author’s hope for mustangs and, by extension, his wishes for U.S. citizens. Philipps, who lives in Colorado, delves into the origin of horses in the West when he joins a geologist and finds tiny dawn-horse jaws. He tells of the Spanish returning the horse to this continent and “the great horse dispersal” to the Horse Tribes. He deals with many writers such as Zane Grey, Owen Wister, and Marguerite Henry; artist Frederick Jackson Turner; entertainer Buffalo Bill Cody; and Western movies and their effect on the American public’s self-image as embodied by the mustang. He explores the agenda of activist horse lovers, including Wild Horse Annie (Velma Johnston), whose efforts resulted in the Wild Free-Roaming Horses and Burros Act of 1971. He examines the consequences of this act, giving equal time to the sometimes conflicting points of view of horse activists, ranchers, and BLM employees. The result of the 1971 law has been a welfare system for wild horses, which means thousands of horses have been caught and are fed for life because not enough people adopt the mustangs. He does not shy away from why many wild horses end up as dog food. Finally, he proposes solutions to the problem of excess wild horses, because the BLM estimates open land can carry a maximum of 27,000 mustangs without undue damage to other plant and animal species. Wild Horse Country is a lyrical, thought-provoking, and comprehensive study of the wild horse question. More, it is good reading.